In Brazil, there are 45 million people, some are disabled but have many abilities. How can we urge Brazil to respect diversity and overcome prejudices? How can skills stand out more than limitations? The Rodrigo Mendes Institute (rm.org.br) is a non-profit organization whose mission is to ensure that every person with a disability has access to quality education in a normal school. The Rodrigo Mendes Institute partnered with the Globo TV Network as part of Globo’s 'Everything Begins with Respect' platform. This platform launched in 2016 in partnership with UNESCO, UNICEF, UNAIDS and UN WOMEN, with the goal to mobilize society to promote a culture that is not only tolerant, but that also campaigns for the rights of vulnerable groups against discrimination and prejudice. When technology and creativity meet social responsibility, amazing things can happen. 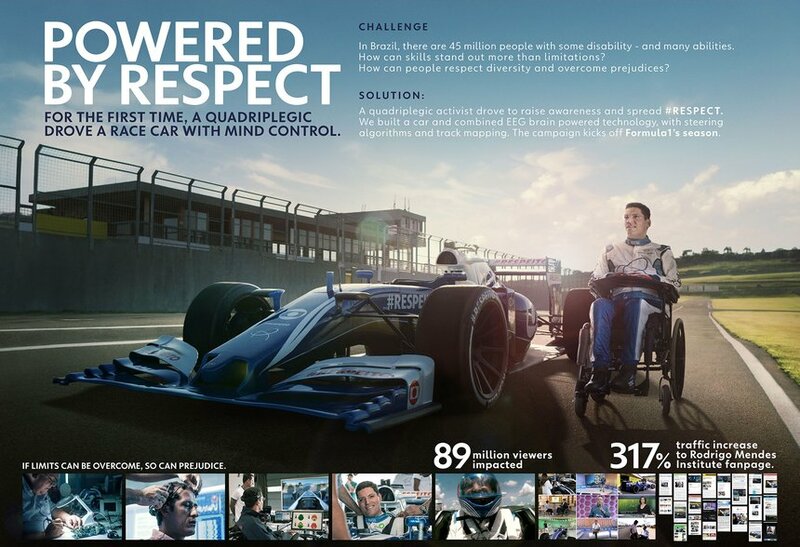 We are proud to say that we created and realized an unprecedented world first: a person with tetraplegia drove an F1 car using only cerebral commands. The project was launched during the broadcast of the new season of Formula 1: Australian Grand Prix. "What motivates us is the constant search for innovation, a way to do something different, to surprise, to enchant. And this award reinforces Globo's ability to innovate in communication, the potential to carry out projects through its own tools and, above all, to generate relevance for brands through our content. Recognition in this category is emblematic: this is a brand building case; Is the brand manifesting itself by one of its main attributes, which is innovation, and showing a new way of doing communication through the medium" says Sergio Valente, Communication Director at Globo TV. “The great creative highlight of this piece is the combination of technology with our 'Everything Begins with Respect' platform. I believe that, more and more, creativity and technology will work together in search of solutions that are positive for people and, consequently, for brands. With the reach of Globo's platforms, we have been able to show a large number of people the campaign and even publicize the opening of the Formula 1 season” says Mariana Sá, creative director at Globo TV.